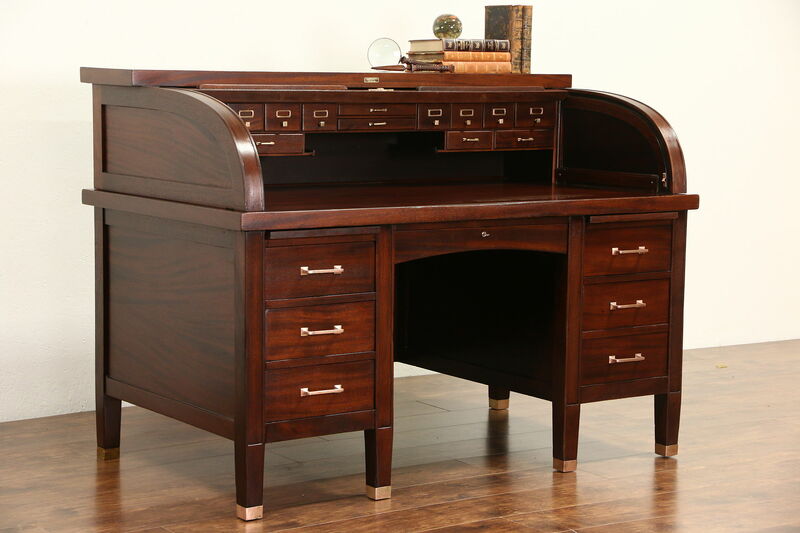 A marvelous mahogany "C" curve roll top desk from about 1910 is signed "Sabath Desk Co., Chicago." The restored gleaming finish is in excellent condition, preserving just enough mars and wear at the edges for a little antique character, see photos. Cast bronze hardware is original on this superior quality office or library furniture. The roll glides smoothly, inside are tiny drawers and cubicles plus pen holders. There is no key for the roll top. Two pull out shelves offer extra work space. Deep lower drawers have dovetailed joints, there is a file drawer with adjustable pusher. The upper section is removable for easier delivery. Dimensions are 5' wide, 3' deep, 44" tall, the desktop is 30 1/2" high and the kneehole is 23" wide and 25 1/2" high.